This vote may occur tomorrow, please speak out now, and pass the word. A new version of the anti-GMO labeling bill commonly known as the Deny Americans the Right to Know or DARK act which is euphemistically named the SAFE Act (Safe and Accurate Food Labeling Act, 2015) seeks to stop states like Vermont from enacting their own GMO-labeling laws and force companies also to take GMO-free labels off food labels. The Senate may vote this week on this Act, please take a minute to take action: Send a letter to your Senators, or call. Wenonah Hauter, Executive Director of Food & Water Watch, writes in EcoWatch (March 15): Last night, Sen. Pat Roberts (R-KS) filed a new version of the anti-GMO labeling bill widely known as the DARK Act, which would prevent states from requiring labeling of genetically engineered (GMO) foods and stop pending state laws that require labeling from going into effect. We urge the Senate to reject this bill that favors the interests of corporations over those of the people. See her article here. Scott Faber, Environmental Working Group: “Americans want to know everything about their food — including what’s in it and how it was produced. This is a trend that should be encouraged, not frustrated, because food and farming have enormous impacts on our health and on the environment. Congress has encouraged consumer interest in food by requiring many food disclosures – ranging from the amount of fat, sugar and salt to whether juice was made from concentrate. Yet tomorrow, the Senate may take a step backward by denying people the right to know about the presence of GMOs. Under the Roberts version of the bill we call the Deny Americans the Right Know, or DARK Act, people would have to call a different toll-free number or scan a different website for each and every product – and there’s no guarantee GMO information would even be provided. It’s ridiculous to expect the American people to wait on hold in grocery aisles or to fumble through websites on mobile phones to find out what’s in their food. But that’s exactly what the new version of the DARK Act contemplates, even though nine out of ten Americans consistently tell pollsters they want the right to know and want an on-package disclosure. Why are food companies fighting our right to know? Read more here. 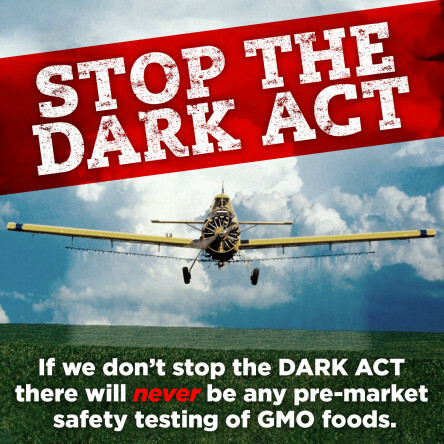 Earlier this month, the Senate Agriculture Committee approved the DARK act (which is what has sent it now to a full floor Senate vote). 14 Senators voted to remove States’ rights, 6 stood up for States. Visit Natural Society for Christina Sarich’s article listing these Senators. For just One reason why every one of us needs to be concerned about GMOs in our food, please see this detailed article at Environmental Working Group, which focuses on the (excessive) pesticide use in GMO crops. “GMO corn and soybeans have been genetically engineered to withstand being blasted with glyphosate – an herbicide that the World Health Organization recently classified as “probably carcinogenic to humans.” The proximity of many schools to fields blanketed in the chemical puts kids at risk of exposure. Overreliance on glyphosate has spawned the emergence of “superweeds” that resist the herbicide, so now producers of GMO crops are turning to even more harmful chemicals. First up is 2,4-D, a World War II-era defoliant that has been linked to non-Hodgkin lymphoma, Parkinson’s disease and reproductive problems. Young children are especially vulnerable to it. 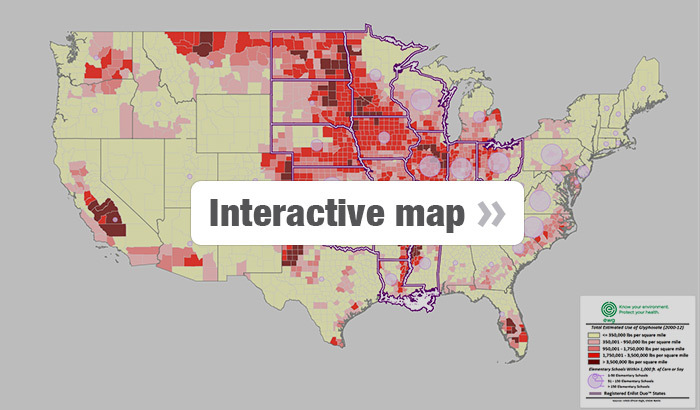 A new EWG interactive map shows the amounts of glyphosate sprayed in each U.S. county and tallies the 3,247 elementary schools that are located within 1,000 feet of a corn or soybean field and the 487 schools that are within 200 feet. Click on any county on the map to see how much GMO corn and soy acreage has increased there as well as the number of nearby elementary schools. The 15 states outlined on the map across the center of the country are the ones where the Environmental Protection Agency has approved the use of Dow AgroSciences’ Enlist Duo – a combination of glyphosate and 2,4-D – on GMO corn and soybeans engineered to tolerate both weed killers. The chart shows the 10 states with the most elementary schools within 1,000 feet of a corn or soybean field. These states account for 53 percent of the total acreage planted with genetically engineered GMO corn and soy. EPA has approved the use of Enlist Duo in seven of them. The inescapable connection between GMO crops and increased use of toxic herbicides is one reason why many people want to know whether the products they buy contain GMOs. Polls show that more than 90 percent of consumers favor labeling GMOs, but without a mandatory labeling law, they have no way to know for sure.” Please continue reading here. For other reasons to oppose the DARK Act, please visit Just Label It, and especially read this article: Top 10 Reasons to Oppose the Senate DARK Act. Again: The Senate may vote this week on this Act, please take a minute to take action: Send a letter to your Senators, or call. Please spread the word as you can in your networks. This entry was posted in Activism, America, Waking Up and tagged children at risk, DARK act, glyphosphate, GMO labeling, Monsanto, SAFE Act, Senate vote, Vermont. Bookmark the permalink.